A while ago, I decided that there was more to collecting an army than ten man squads. A lot of the time I have based my army collecting on rule-sets or army books and I thought that I'd have a change of pace. The first thing I had to do was to completely ignore any rule set. Once I had completely freed myself of those limits, I went on line and started looking for modern military organisation plots; often referred to as TOE (Table of Equipment) or ORBATs (Order of Battle). Looking at the above chart, you can see that most of the units are broken down into 4 man fire-teams. A pair of fire-teams makes a section for basic infantry but things start to get a little different for the specialist units like command and support. You will also see that the various sections have their own transports; in the case of the specialists, the smaller size of each unit still gets a transport, even though they number less than 8 members. Generally speaking, the support unit is attached to the command unit. So...from a Grymn perspective, I thought it would be better to make things even simpler by limiting all of the units to multiples of fire-teams. This not only keeps things simple but also makes it easier to designate vehicles. 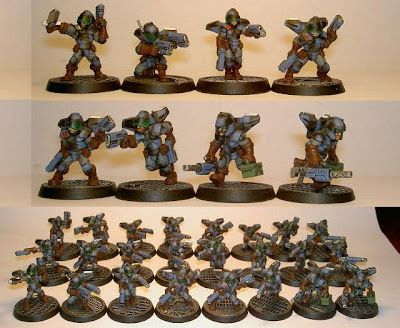 To start with I wanted to build a jump-pack platoon. This would consist of two sections of infantry (each with two fire-teams), a support section (one fire-team of four) and a command section (one fire-team of four). Looking at the chart, the basic infantry fire-team consists of a leader, two basic troops and a support weapon trooper. A quick look through my box and I found enough flame-throwers to fill all of the support for the basic infantry sections. I chose the close-combat Grymn for the basic infantry; each one having a brace of pistols. Next was the support section. Again, looking at the chart, it seems that there are two support weapons in the fire-team and it would seem appropriate for these weapons to be a little more destructive than those in the basic fire-teams. Because this was a jump-pack based platoon, I thought that I needed to keep the support weapons fairly light but able to pack a punch so a heavy machine gun was the obvious choice. For the command section, I chose a junior officer, a senior leader and a pair of junior leaders...one having a radio set. The transports for this platoon would each be capable of carrying 8 fully equipped troops and should also be something like a helicopter that could get the jump-troopers into position to drop them off and give covering support once they were deployed (the transports effectively acting as the Warrior IFVs for this particular platoon). This skimmer will be capable of carrying 8 troops and will allow them to jump from the rear, at altitude, to drop on their foes and enter the fray quickly. I have 3 of these to carry each infantry section and the command and support sections combined. 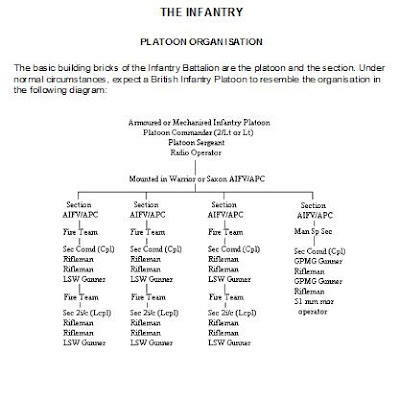 Now that I have the basic building block of the army; the infantry platoon, I can add multiples to build up my forces but an army needs a command structure and this one is no exception. The problem is that I haven't got as far as building a command platoon...so I'll have to save that for another day....along with the heavy support and scout elements of the army.